Before I get started – if you want a downloadable Game Day Nutrition “Cheat Sheet” Guide you can get it here. All hockey players know that what we eat is important, but how about when you eat it? Especially if it’s a game day? In this article, I want to take a brief look at the “why” behind nutrient timing for hockey athletes but put a greater emphasis on the “how” this time (in comparison to previous articles, which were pretty heavy on the science). That right there will take you a long way, provided you’re staying consistent and not completely blowing it from time to time. But, hockey athletes are a different breed. Hockey athletes are involved in regular and intense physical activity. To keep all of these balls in the air, you’re going to need an adequate nutrition strategy, and that strategy should be timed appropriately for optimal results. Timing matters more so due to digestion and absorption rates more than anything else. You are going to want to choose faster-digesting protein and carbohydrate sources so that they can enter the bloodstream at a rate that aligns with when the physical activity is going to begin. In this case, your hockey game. To do this, we primarily want to stick to a good source of protein and carbohydrates, and it’s best to keep the fats quite minimal in this pre-game window. Not because fats are necessarily “bad” – but because we know from digestive physiology that fats slow down the rate of absorption. So, if you were to have protein and carbohydrates alone, they are going to reach the bloodstream at a much faster rate in comparison to a meal that contains protein, carbohydrates, and plenty of fats. This isn’t a bad thing for everyday life, we need healthy fats in our diet in order to sustain many important functions. The problem here is that too many fats in the meal will slow down digestion so that nutrients don’t get to our bloodstream in time, and when you slow down digestion…guess what happens? Food sits in your gut. And the last thing you need when you’re out on the ice trying to perform is a bloated gut. Beyond this, fats also don’t serve hockey players their primary fuel source, which is carbohydrates. Make no mistake about it, hockey is a glycolytic sport. Meaning, the energy systems we use, and the nature of the game prioritize carbohydrate use for performance and not dietary fats. Having gone through that little “fat caveat” – let’s switch gears and talk about what you can do. Although the science can run very deep here, and I’ve written articles in the past if you’re interested in diving all-in on the research, the recommendation is quite simple. Ideally, you would consume anywhere from 35-45g of protein if you’re a man, and 25-35g of protein if you’re a woman. It’s also best if you consume this in the form of whole food, and not supplementation. Things like lean meat, eggs, and low-fat dairy are all viable options. Once again, the science can run very deep here, and I’ve covered this in extreme depth within the past articles, but, the recommendation is quite simple. If you’re in a league where your games only last about an hour, 35-45g of carbohydrates for men, and 25-35g of carbohydrates for women will suffice. But, if you’re in a game that lasts 90-120 minutes or more in total duration, it’s best to consume 70-90g of carbohydrates if you’re a man, and 50-70g of carbohydrates if you’re a woman. Essentially, if it’s a game that is only an hour, a 1:1 ratio of carbohydrates to protein will be enough. But, if you’re in a longer duration game you’re going to want to be closer to a 2:1 ratio of carbohydrates to protein in order to adequately fuel yourself. Depending on what suits your practical needs, you can always switch these up based on your own preferences. These are just example options that I have prescribed for my personal 1-on-1 hockey athletes, they are not to be viewed as “rules” by any means. Secondly, although it’s mentioned above, I want to reiterate that it’s best to consume this meal 1-3 hours prior to a game. I provide that range because you know your body better than I ever will. Some people have no issues whatsoever eating their pre-game meal 3 hours before, whereas others would be starving right before the game if they did that. In any case, the physiology is still the same (in that the nutrients will still be in your bloodstream), so pick a time that works for you and stick with it. *1 cup if the game is less than an hour, 2 cups if it is 90-120 minutes or more. *Eliminate the brown rice if it is a 1-hour game. *Eliminate the juice if it is a 1-hour game. *Eliminate the blueberries if it is a 1-hour game. NOTE: Female hockey players should cut all of the above serving sizes in half. If you want a downloadable Game Day Nutrition “Cheat Sheet” Guide you can get it here. At the end of the day, how much you eat is much more important than when you eat it. 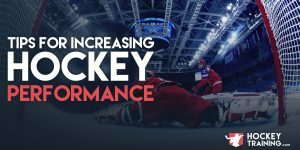 But, once you have a good framework set in place, nutrient timing strategies such as the above can really help boost a hockey players performance and recovery. Use some of the examples above to help guide you in the right direction and let us know how it goes! 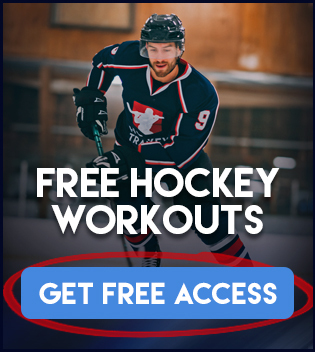 If you’re ready to take your hockey training serious and become a better hockey player check out one of our hockey training programs today! I have started eating these meals up above, and have been feeling more energized before and after games.